The Compaq Portable 486C from 1992 - not exactly a dinosaur but awesome in it's own right. Many thanks to Radar off here for letting me hold on to this gem. Also for your amusement, search for "Compaq John Cleese" - hilarious adverts. That was great Jono. I've seen pictures of these side-opening-type Compaq luggables before but have never seen them in the flesh or up and running. An interesting design. I didn't realise they went right up to VGA and 486. Tell me, is the video, printer, RS232 etc. built into the board or do you need plug-in cards for those? How easy is it to install the cards? That sound was built in, yes? Did it need a special driver? Is there a special compaq diagnostic partition like there is some of their other machines? Yes, DOOM is my ultimate 486 demo game also. It was good to hear the theme from Larry again...I haven't heard that tune for about 20 years! It triggers some nostalgia. tezza wrote: That was great Jono. I've seen pictures of these side-opening-type Compaq luggables before but have never seen them in the flesh or up and running. An interesting design. I didn't realise they went right up to VGA and 486. Cheers There was a model after this one too, the 486C/66 (although throwing in a DX2/66 isn't really a milestone). tezza wrote: Tell me, is the video, printer, RS232 etc. built into the board or do you need plug-in cards for those? How easy is it to install the cards? That sound was built in, yes? Did it need a special driver? There is three boards internally which make up the system unit The main motherboard is mounted vertically behind the screen (and behind the speaker/controls). A second board runs the Parallel/Serial/FDD/PS2 ports and 2xEISA slots. With the back off, these two boards connected look like a big "L". The third board is the VGA card, which plugs in to the motherboard and sticks it's DB15 connector out the side. The sound comes from a standard PC speaker - Compaq just added a 3.5mm mono output jack and a volume control - I'd have loved it if more computer makers did this in the pre-soundblaster era. The RCA outs you see on the side - that's actually my dead Sound Blaster clone which I need to replace (it detects fine, just no output). Slotting in the cards is very easy, as there is lots of room and they just mount vertically (like a normal PC) - although I remember it being a bit fiddly doing up the screws. They're all security hex screws in true Compaq style. I'll take photos when I open it up to replace that sound board. tezza wrote: Is there a special compaq diagnostic partition like there is some of their other machines? I can't be 100% certain, but pretty sure it's just the Compaq Diagnostics disk. I used a copy of this when it first arrived as it's HDD was failing. My Pentium Presario has that partition and the GUI BIOS though. tezza wrote: Yes, DOOM is my ultimate 486 demo game also. It was good to hear the theme from Larry again...I haven't heard that tune for about 20 years! It triggers some nostalgia. I'd better pick something soon. Also got an unused Microsoft glossy InPort mouse with the original card for 5 bucks. I have two of the cards already, but never actually had an InPort mouse before. Card has the usual jumpers - primary/secondary, IRQ, and XT Slot 8 / Normal. I'm thinking I'll give it to my turbo XT which will also be getting a HD 8 bit floppy controller - so I can have a 1.44Mb B drive. SpidersWeb wrote: Also got an unused Microsoft glossy InPort mouse with the original card for 5 bucks. I have two of the cards already, but never actually had an InPort mouse before. Card has the usual jumpers - primary/secondary, IRQ, and XT Slot 8 / Normal. I'm thinking I'll give it to my turbo XT which will also be getting a HD 8 bit floppy controller - so I can have a 1.44Mb B drive. I remember using one of these in the day. It is a card mouse yes? I remember getting mine in a big box with Show Partner (precursor to Powerpoint) and a Paint program. I'd bought Windows 1.0 at the same time. Yep, has it's own ISA card, some people also call them a bus mouse. I didn't actually know they kept making them beyond the green eyed monster era. Show Partner is interesting, first time I've heard that name. I do have a Microsoft Mouse and Paintbrush (for DOS) pack here though (serial). That Windows/286 pack came with an InPort mouse too but the mouse had run off at some stage. Bought another XT clone on trademe last week, you guys might've seen it, had twin Tandon floppy drives. Anyway it'd been in a garage by the sounds of it for quite some time. I wanted it so I could restore it and make a restoration video. Boots fast, it's on the floppy drive in around 1 second. I've also finished my AI 286 PC16 laptop, it's as quiet as it should be now booting off a 45Mb Rodime. 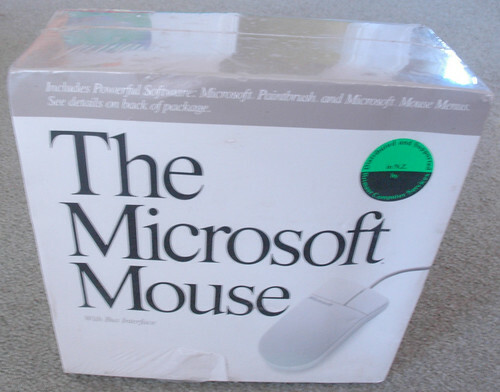 Here's a couple of boxed early MS Mice from my collection. 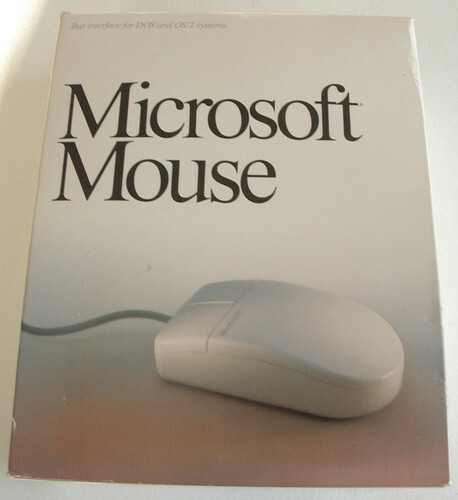 It's not just any Microsoft Mouse, it's THE Microsoft Mouse. I haven't seen that box before! Anywho I'm not sure what is going on, but my subscribers have over doubled in the last 24 hours. So I'm going to have to get my A in to G and start putting together some better quality stuff. - IBM 5170 upgrade - it now runs a 320Mb Miniscribe ESDI drive from 1989 and has 640KB + 3072KB. - 486DX/40 CMOS battery replacement and I have to build it - it's really a 386 board with a 486 CPU but I have a nice 1Mb ISA card that actually has VESA support (as in the graphics standard, not the bus). Not too bad. I don't think it's garbage but like everything, there is room for improvement. My suggestion would be have a closer image of the screen so the viewer can read it. I find narrating on the fly difficult and I always record the images first, then narrate over the top of that. Also, you went through FDISK pretty quickly. Not everyone will know about FDISK so if it was me, I'd spend a bit more time on it. I think videos like this are important. Low level formatting was a mystery to me when I got my XT and it took me a while to figure out all the nuances. A video would have helped. I''m still amazed the Microsoft, even as far as MS-DOS 3.3, still hadn't replaced that awful edlin program with a full screen editor. Thank goodness a few public domain/shareware ones were around at the time. Edlin should have been dumped after PC-DOS/MS-DOS 1.0. It would have been a trivial exercise to write a full screen editor and the 5150/5160 machines had more than enough capacity to use it. I used to use my Xywrite editor or one called "Mince" as a full screen text editor. Both fitted easily on a bootable 360k disk. I never used Edlin. Thanks Tez, that's excellent feedback. I'll see what I can come up with this weekend. Yeah I thought the lack of full screen ASCII text editor was odd, and even when added in 5.0 it was the QBASIC editor with different labeling. I'm not sure why you'd want a line editor - perhaps it was just easier to write and smaller? I generally drop to the console and run Vi(m) when I need to edit plaintext on my modern machines. Not identical but quite similar in a lot of respects. I guess I just don't like graphical interfaces to my text editors. Back around 2000 my boss forced me to edit perl scripts with vi. Glad he did, the commands may be obtuse but it's very efficient. I use it almost daily at work. Being able to use regular expressions is nice too, not a huge number of editors do that. I didn't realise how old it was until recently, found it on my IBM RT 6150 as part of AIX 2.2.